I love the Love Bug set -- it's so stinkin' cute! I layered Certainly Celery, Old Olive and sheets from the Tea Party ds. The large pink flower and small yellow one were cut out from the Tea Party ds, then I added a rhinestone brad to each for the centers. I used the new bird punch and cut out the bird from Almost Amethyst, the wing from the Tea Party ds and the leaves/stem from Old Olive. The purple bug to the upper left was cut out, the wings were glittered and adhered with a Dimensional. 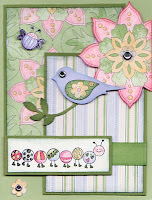 Too cute, I love the bright, springy feel. I'm so tired of winter.